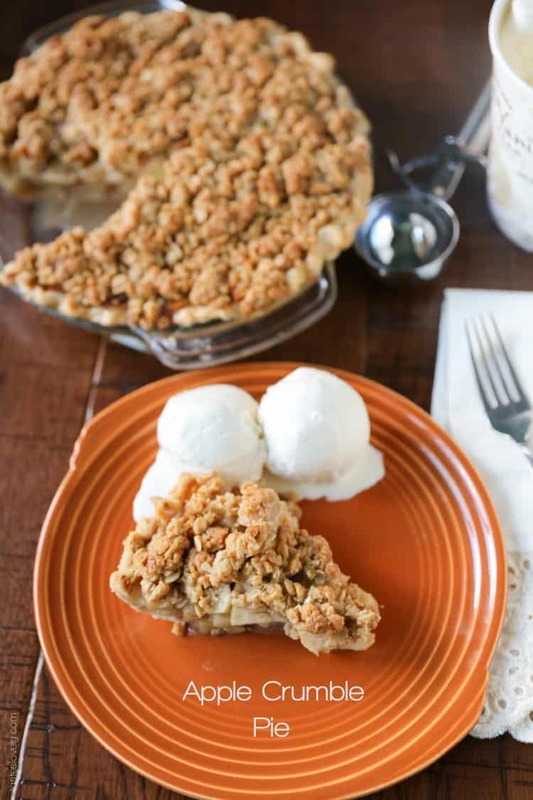 A simple apple pie recipe with a crunchy, buttery oatmeal crumb topping is a tasty spin on the traditional apple pie. I have yet to be called up to the “big leagues” to cook and host my own Thanksgiving dinner. I can handle making dinner for 6-8 people. But 30? Eeeek! I start getting the kitchen sweats just thinking about it. You guys get the kitchen sweats too, right? You know, that light layer of sweat the starts to accumulate about 5 minutes before dinner is ready when you have company over? And then kicks in to high gear as you’re plating up? And you sneak in to the bathroom to try and dab it away with a Kleenex and hope that if you put on more face powder no one will notice? The kitchen sweats. Instead of cooking the day of, I am cooking the day before making appetizers and desserts. Isn’t it funny that on a day of eating such a big dinner we have food for “before we eat” and then more food for “after we eat”. Hey, it’s Thanksgiving, let’s eat all the food! And if there is one dessert that is mandatory after eating turkey and stuffing it is apple pie. And even better than apple pie is apple crumble pie. You know what traditional apple pie is missing? Crunch. 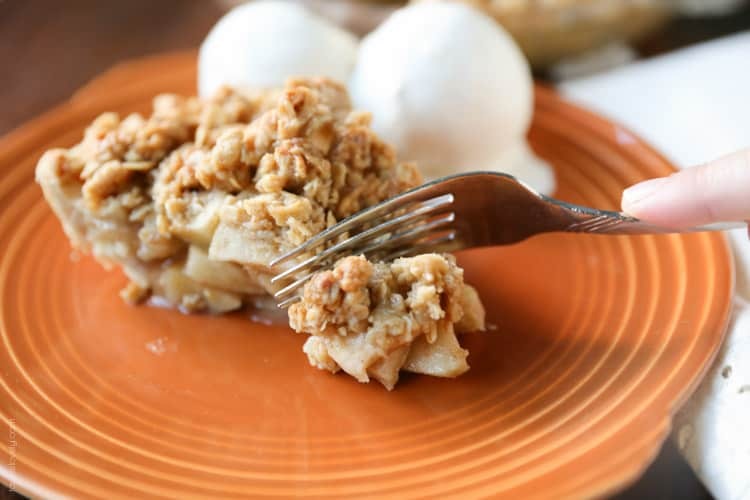 After much trial and error, I have created the crunchiest oatmeal topping for you to top your apple pie with to bring it to a whole new level of crunch. Shall we talk easy? 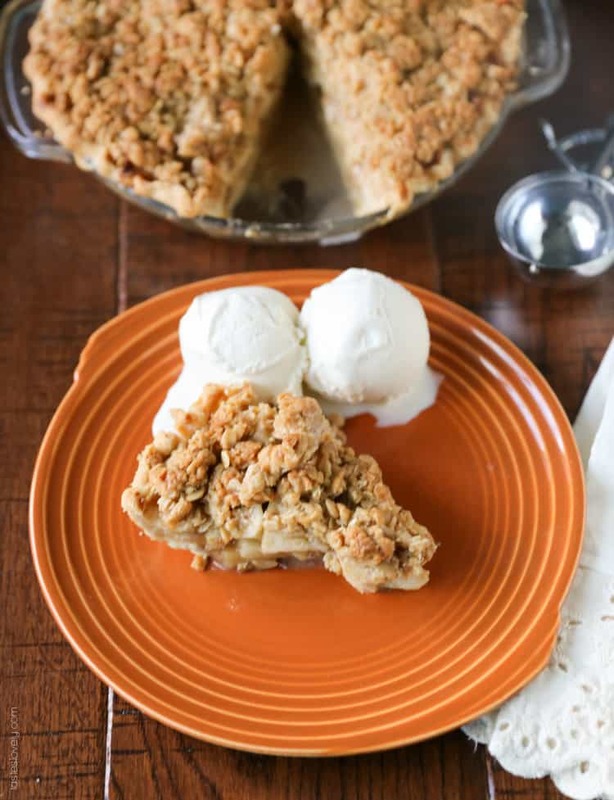 Let me let you in on a little secret, this apple crumble pie uses store bought pie crust. Trader Joe’s makes a delicious pie crust that tastes just as good and flaky as anything I can make. You can of course use a homemade pie crust, but when it comes to the holidays easier is always better. Am I right? I will be making several of these to bring to my family Thanksgiving dinner. I highly suggest you try this new spin on apple pie, you may never go back. 2. Press the pie crust into a 9 inch pie plate, trimming off the excess and crimping the edges. Put in the fridge. 3. In a medium size mixing bowl, make the crumble topping by combining 1 cup rolled oats, 1/2 cup packed brown sugar and 6 tablespoons all-purpose flour. Toss the ingredients together to evenly combine, breaking up any chunks of brown sugar. Combine the cold butter into the dry ingredients by squeezing and breaking it up with your fingers until crumbs form. Cover with saran wrap and put in the freezer. 4. Peel and core the granny smith apples. Slice the apples into slices that are 1/8″ thick and 1″ long. In a large mixing bowl, toss the apple slices with the lemon zest and lemon juice. Then add in the 1/2 cup granulated sugar, 1/4 brown sugar, 2 tablespoons all-purpose flour, cinnamon and nutmeg. Toss to evenly combine. 5. Take the pie crust out of the fridge and pour in the apple mixture. 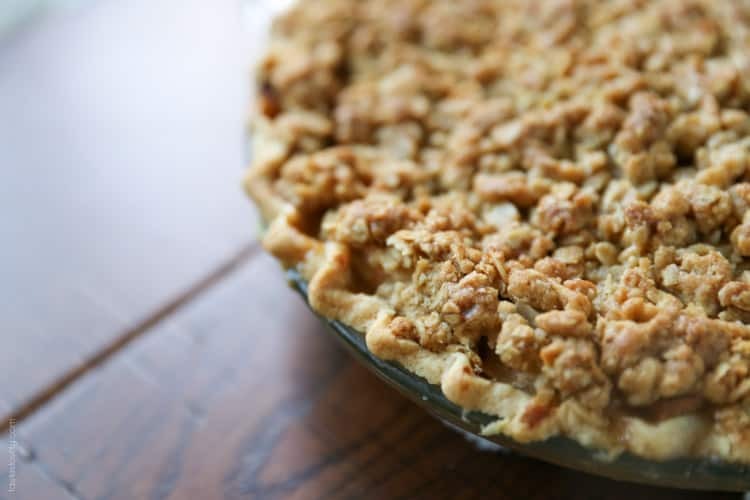 The apples should be about 1/4″ – 1/2″ taller than the edge of the pie pan. 6. Take the crumb topping out of the freezer. Should be very cold and almost hard. This is good. Take a knife or pastry cutter and break up into large pieces. Then, use your fingers to break into smaller crumb pieces, using medium pressure to press into an even layer to the pie. 7. Place the pie plate on a parchment lined baking sheet to protect your oven if it bubbles over. Bake at 400 degrees for 20 minutes, then lower the oven to 350 degrees and bake for another 35-40 minutes, or until the crumb topping is golden and the pie is bubbling. 8. Allow to cool for at least 6 hours at room temperature uncovered. I like to make mine 24 hours in advance, and leave it uncovered on the counter. Serve at room temperature or reheated in the microwave for 45 seconds. Serve with ice cream or whipped cream. 9. Refrigerate after 24 hours. Will keep in the fridge for 1 week. This pie can be frozen. After pressing in the crumble, but before baking, place the pie uncovered in the freezer for 12 hours, the cover tightly with aluminum foil for long term storage. Will keep for 6 months. Thanks Kelly! The topping is so good. I was serving it to my family last night, and every little crumb hunk that fell off quickly got popped into my mouth. Ha! Thanks Shea! I may have had 1.5 slices of it last night, and might have another slice tonight, *wink*. This pie looks so delicious. I love apple pie. I can totally relate to the kitchen sweats thankfully I’ve learned how to control them. :) don’t you just find it gross watching some of the chefs on TV sweating all over the place. I love the topping. looks delish! Thanks Dina! It’s so yummy. This apple pie looks delicious. 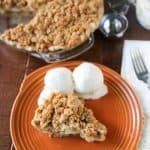 I recently made an apple crumb pie and I agree that crumb topping is the best way to go! Nothing like apple pie after a huge Thanksgiving feast. Thanks Rachel! I like crumble pies much more than “double crust” pies now. I’ll have to check yours out too! 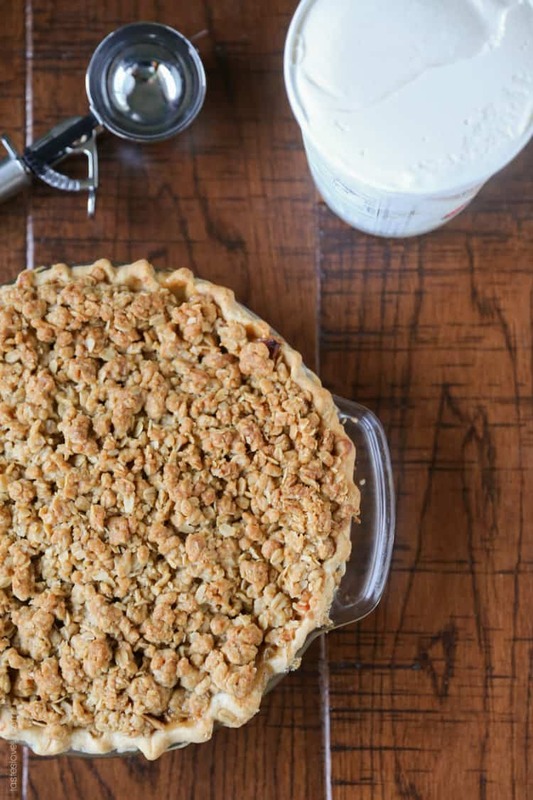 I have been searching for a great apple crumb pie to make for Thanksgiving. I found yours on foodgawker. This looks perfect! Thanks for sharing Natalie! Oh, I’m *so* glad you found my recipe Meaghan! Your family will love this. Let me know how it turns out! This pie is gorgeous! Natalie, you have beautiful photos. 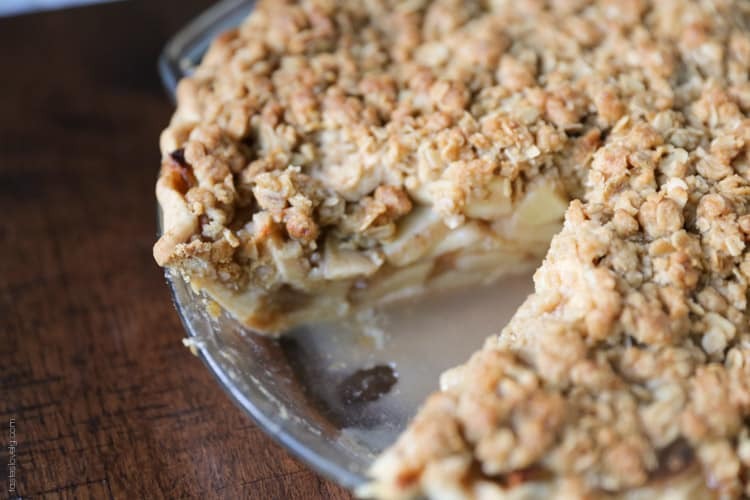 Apple pie is my favorite dessert ever and I need to make one with crumble on top like this. So good! Thank you *so* much Sally! That’s a huge compliment coming from you. And thanks for stopping by my blog, what an honor! Hope you and your family enjoys the pies! SUCCESS! Tons and tons of compliments and requests for the recipe. Managed to give it three hours in the fridge before cutting into it and that was fine. SO GOOD. Thanks again!! Amazing recipe. Wonderful to be here. Like to say Merry X-Mas & Happy New Year. Keep sharing such delicious recipe. Thanks. I baked this pie today for thanksgiving and my family loved it! Thank you for sharing! 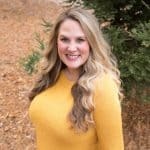 I am so happy to hear that Katie! I made this pie yesterday too! Baking twins : ) I’m glad your family liked it. And so impressed you’re baking at 14! You’re way ahead of me, I don’t think I started baking until after high school. Hope you had a great Thanksgiving with your family! Thanks for telling me you liked my recipe, you just made my day! I am so glad you liked it Kaitlyn! Thanks for letting me know you tried my recipe and liked it. You made my day! I made this tonight to be served tomorrow after thanksgiving feast! I just hope I last till then… it looks so good I’m drooling! Thanks for sharing!